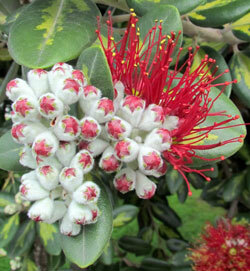 New Zealand Christmas tree is a showy evergreen shrub that reminds one of a bottle brush. Although this tree looks great in other cities on the peninsula (Monterey, Carmel, Seaside) I have only seen it thrive given careful thought to location. In Marina it has shown FROST DAMAGE. New Zealand Christmas tree is drought tolerant, grows in in coastal spray and wind, as mentioned before, is incredibly sensitive to frost. This tree is not fussy about soil, and can be grown near lawn water. Its roots are considered invasive and, although tagged as a good street tree, mature trees can lift sidewalks. 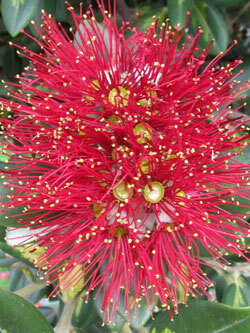 Vivid red blossoms appear around December — hence the "Christmas" in the name. There is a variety with golden blossoms called 'Aurea' too. 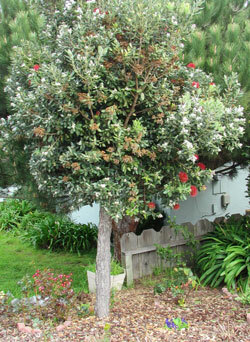 Pollinators and hummingbirds love this tree. Few pests and low maintenance should make this a great selection BUT it will show damage even by light frosts.With this in mind, trees sited near warm walls, away from direct wind will probably be less susceptible to ocassional frost. It is reported that the trees become more frost hardy as they get larger. Cross your fingers. I have see this tree blacken and die in my yard during the 2007 frost and it had been in the ground several years. Some sources say this tree is short lived - only around 30 years. However, the biggest New Zealand Christmas tree (Te Waha o Rerekohu - yes, it has a name) is reported to be over 300 years old! *note asterisk denote species will be shaped by a prevailing wind. Single trunk trained trees need more protection than multi-trunk to grow straight. This tree needs protetection from the wind to look good. **note asterisk denote species has proven to get trashed from any frost activities.Most of the time it recovers, but not always. ***note species been reported to have a very invasive root system in mature trees. Not good near sewer lines or walkways. ****note species is low maintenance, but frost sensitivity may mean you will end up replacing it sometime in the future. Location Nice specimen on Crescent between Carmel and Morse Court. Unhappy specimens on Del Monte Avenue down by Vince DiMaggio Park (wind whipped and long frost recovery). The plantings at the Dunes shopping center look okay except for the windier parts of the parking lot.